Geneva - The International Air Transport Association (IATA) released data for global air freight markets showing that demand, measured in freight tonne kilometers (FTKs), decreased 4.7% in February 2019, compared to the same period in 2018. This was the fourth consecutive month of negative year-on-year growth and the worst performance in the last three years. · And the Purchasing Managers Index (PMI) for manufacturing and export orders has indicated falling global export orders since September 2018. · Asia-Pacific airlines saw demand for air freight contract by 11.6% in February 2019, compared to the same period in 2018. Weaker manufacturing conditions for exporters in the region, ongoing trade tensions and a slowing of the Chinese economy impacted the market. Capacity decreased by 3.7%. · North American airlines saw demand contract by 0.7% in February 2019, compared to the same period a year earlier. This was the first month of negative year-on-year growth recorded since mid-2016, reflecting the sharp fall in trade with China. North American carriers have benefited from the strength of the US economy and consumer spending over the past year. Capacity increased by 7.1%. · European airlines experienced a contraction in freight demand of 1.0% in February 2019 compared to a year ago. The decline is consistent with weaker manufacturing conditions for exporters in Germany, one of Europe’s major economies. Trade tensions and uncertainty over Brexit also contributed to a weakening in demand. Capacity increased by 4.0% year-on-year. · Middle Eastern airlines’ freight volumes contracted 1.6% in February 2019 compared to the year-ago period. Capacity increased by 3.1%. A clear downward trend in seasonally-adjusted international air cargo demand is now evident with weakening trade to/from North America contributing to the decrease. · Latin American airlines posted the fastest growth of any region in February 2019 versus last year with demand up 2.8%. Despite the economic uncertainty in the region, a number of key markets are performing strongly. Seasonally-adjusted international freight demand achieved growth for the first time in six months. Capacity increased by 14.1%. 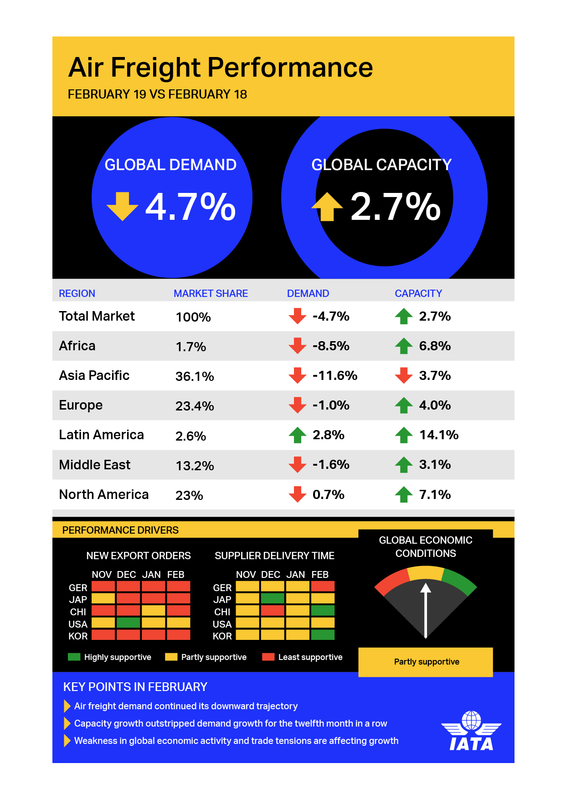 · African carriers saw freight demand decrease by 8.5% in February 2019, compared to the same month in 2018. Seasonally-adjusted international freight volumes are lower than their peak in mid-2017; despite this, they are still 25% higher than their most recent trough in late-2015. Capacity grew 6.8% year-on-year.